Christmas will be here before we know it! Gosh, where has the year gone?! Today is my BIRTHDAY! I'm one of those unlucky few with a birthday in December so I always used to get the "here's your birthday/Christmas gift!" nonsense, sigh. Anyways, I have some cute nail art gem from Born Pretty Store to share with you all today. These 3d Christmas gems are the perfect companion for those upcoming holiday manis. They include a snowman, wreath, candle, present, santa, etc. 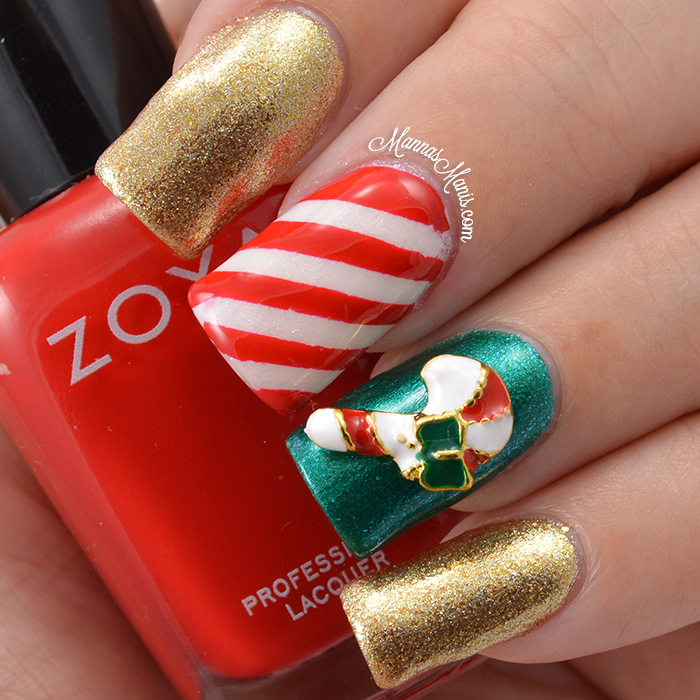 I chose to use the candy cane because I also wanted to do a stripe accent nail that looks like a candy cane. I chose only colors that are on the candy cane gem. If you want longevity with these, I suggest using nail glue. I swatched and removed, so using top coat to place it sufficed for me. If you would like to pick these up then you can do so HERE for $4.49 and be sure to use my code AMABK31 to get 10% off your order or you can click on the banner below!